... the former Carlyle partner has been tasked with the most impossible job in the world: to gradually unwind this bubble without crashing the global financial system in the process. 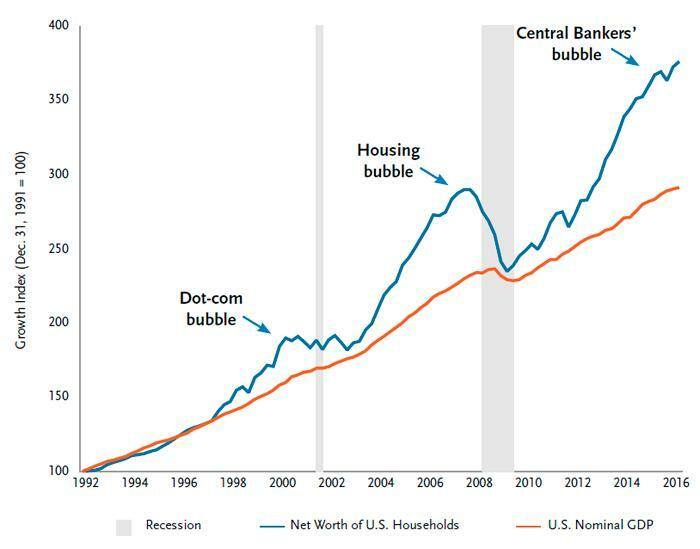 That, of course, is an impossible task in a world in which the bursting of every asset bubble in recent decades was "fixed" by reflating another, bigger bubble. Not helping matters, at the same time as he tries to keep the global financial system from disintegrating, Powell has the world's most powerful person breathing down his neck, as the US president demands roughly every day that the Fed chair keep the party going and the punch bowl flowing at least until the 2020 election. Which is ironic because the same president two years ago correctly lashed out at Janet Yellen for creating a "stock bubble" and a "false economy" to boost his predecessor, Obama. Of course, now that he is on the receiving end of the Fed's generosity, the last thing Donald Trump wants is for the stock bubble to burst. Which is why one can't help but feel empathy for Powell. And yet, there is a reason why Trump is at least partially right to "dislike" Powell. 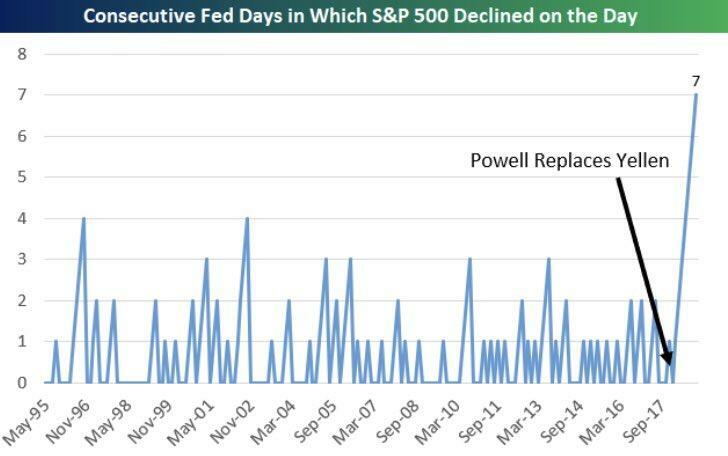 Presenting exhibit A - a chart courtesy of Bespoke Group which shows that the S&P has fallen on all seven days in which the Fed announced its policy decisions during Powell's tenure as Fed chair, which started in February. This is a record long stretch and a clear outlier to the market performance under Powell's predecessors. It also suggests that the famous "Fed Drift" has been replaced with a "Fed Draft." While the average drop for the S&P during Powell's seven "Fed days" was -0.5%, it outdid itself today when the S&P lost just over 1.5%, tumbling to fresh YTD lows, it worst "Fed day" return in years. And though we doubt that Powell is actively trying to sabotage the market - his predecessors already did that - and humiliate the president as the Fed chair has no choice but to keep hiking if he has to have any hope of ever undoing the idiocy of Bernanke and Yellen, who saddled him with the biggest asset bubble in history, one can also see why Trump's next tweet addressing Powell may contain the former game show host's two favorite words: "you're fired."